Historical fiction book crack. This is the most accurate description I can muster up for The Boleyn King, The Boleyn Deceit and The Boleyn Reckoning as a collective set of novels. I started the first one and couldn't put it down, so on and so forth. Thank goodness I had all three out from the library so I could read them one after the other! Andersen manages to create a believable, fictional alternate history all her own, even as she infuses it with characters and events from actual Tudor history; the combination simply works. It is, without a doubt, the type of series that you simply must binge, as you won't be able to stand not knowing what happens next for the Holy Quartet, also known as the main characters of this series - Minuette, Dominic, Elizabeth and William. Minuette is an orphan raised as a royal ward by Anne Boleyn, a girl who is kind and unassuming and brings cheer to the lives of the others. Dominic is a trusted, loyal friend, a source of stability and great wisdom when faced with all the harrowing situations they encounter. Elizabeth, Anne Boleyn's daughter, is a princess who was born to be a leader. William is the heir that Henry VIII so desperately wanted, a young, untried king who must do what he can to rule a country that threatens to come apart at the seams. Each member of the Holy Quartet gets the opportunity to narrate their story. They are such complex characters, written with their raw passion, deep desires, great sorrows, logical fears, and I admired the fact that Andersen was not afraid to show us the entirety of these personalities. These four may be the main players, but they're merely a drop in the ocean when it comes to the large cast of characters that appear in the course of three books. There are characters you will immediately come to love and hold in great esteem; there are characters you will want to rage against and possibly murder. It's a testament to Andersen's ability to coax these personalities out, to make them memorable even if there are so many. Just like most Tudor stories that I've read, the plot of this one is equal parts power and passion. There are threats to the throne, internal and external alike; there are relationships that toe the line between enmity and balance, between friendship and romance. It is as fascinating as it is troubling, and yet, it's not at all hard to be completely drawn into the twisted insanity that is life in the time of the Tudors. Even when your heart is beating out of your chest, even when you're afraid to find out what will happen, even when you know things are going awry - it's impossible to look away. My entire reading experience of this trilogy came complete with heightened emotions, an insatiable curiosity and much affection for these characters. It was definitely an unexpected surprise to find myself so invested in their stories, as individuals and as a quartet, but it certainly makes me grateful to Kelly for pushing me to read these. If you are well-versed in Tudor history, you'll enjoy seeing this alternate version of it. And if you aren't, you'll be buoyed by the entertainment of the twists and turns of these characters' stories. This series is perfect for a binge read, and definitely worth checking out. The Boleyn King is filled with introductions to the Holy Quartet, as well as the people that surround them. It showcases the relationships - friendship, romance and enmity - really well, and allows the readers to get a handle on the dynamics in play at court. There's a hint of mystery woven through this one, as well as historical details blended just right to make this alternate history a believable experience. It's total book crack, and I devoured it really fast! 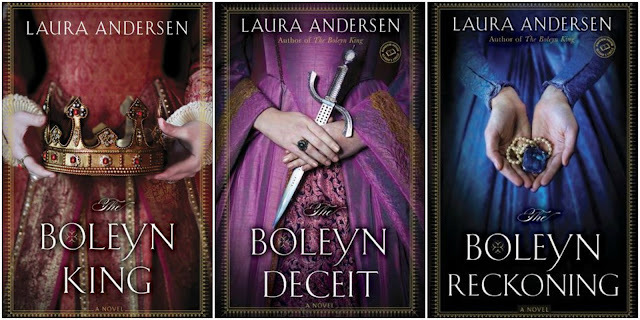 The Boleyn Reckoning is a hell of a reading experience, mostly because I felt like I was dying of tension with every chapter. But Andersen plotted out her series arc well, because everything comes to a definitive end with this part of the story. It was painful and horrifying, but it also felt like a necessary, logical set of consequences to what had come before. It hurts so good, basically.